What are the benefits of All on X Dental Implant Hybrid (prosthesis) compared to a removable denture? Dentures reduce mastication function, speech function, and over time contribute to excessive bone erosion, changing both the dimensions of the jaws and negatively impacting all esthetics of the face. Removable Dentures typically are made of PMMA or acrylic material which to which plaque and bacteriostatic elements accumulate making it a less than hygienic option. Fixed hybrid implant supported prosthetics also knowns as “All on X” attach to dental implants via screws, inserted through a titanium or ceramic substructure (frame), have been used to successfully restore fully edentulous patients for decades and are known to be lower cost. Fixed hybrid dentures are typically made of acrylic materials, which after years of experience, Dr. May and other top restorative dentists determined are suboptimal as long term restorative solutions. The acrylic fixed hybrid dentures’ durability and aesthetics, leave much room for improvement, which is why Dr. Yuriy May offers full arch implant supported zirconia prosthesis restorations. The All On X Dental Implant based Full-Arch Implant Prosthesis used by Dr. May eliminates these issues, providing a restoration that is more durable in the long term, while sacrificing nothing when it comes to aesthetics. Dental implants as a foundation for fixed full-arch prostheses has substantially and dramatically enhanced the quality of life for patients with missing teeth, especially compared to removable dentures.1 Wether considering an All on 4 or an All on 6 Dental Implants, the results are life changing for many of Dr. May’s patients. For many years now, Dr. May’s edentulous (toothless) patients along with those patients experiencing conditions warranting the removal of their remaining teeth (think: severe periodontal disease, bone loss or decay) have opted for having dental implants placed placed to retain beautifully made implant-supported prosthesis also known as a bridge. The superiority of ALL ON X fixed full-arch implant restorations compared to conventional dentures cannot be overstated: it is simply life changing, as Dr. May’s patient’s declare time and time again. Why Are Implant Supported Dentures So Much Better than Removable Dentures? Fixed Implant Supported Full Arch Prosthesis – What Kind is the Best? What does “All on 4 Implants” or “All on 6 Dental Implants” Mean? 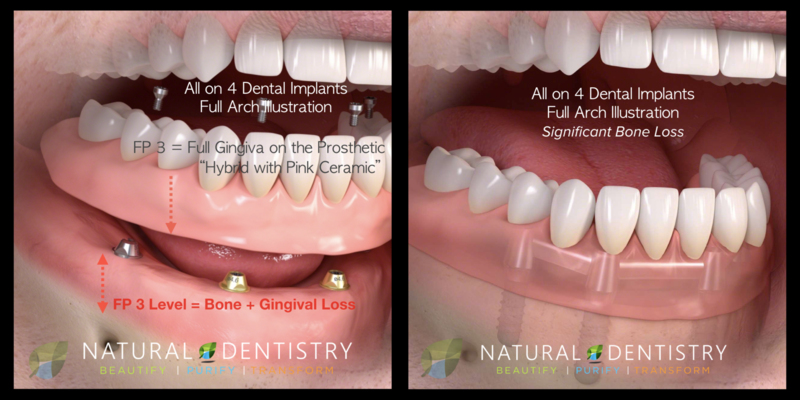 The terminology “All On 4” refers to full mouth reconstruction cases for a single arch, as in implants placed in the maxilla (upper arch) or mandible (lower arch). Specifically “All on 4 Dental Implants” means that “All” the teeth of the prosthetic (typically 10-12 prosthetic teeth per arch) will be placed on the “4” dental implants that are the only fixed anchorage devices holding the prosthetic (denture) to the implants to create the “teeth”. All on 4 means that the implant dentist will remove all remaining teeth or if the patient already has no remaining teeth, only 4 dental implants will be surgically placed into the jaw. On the 4 dental implants, which will be the only anchorage devices in the upper or lower jaw, “All” the teeth of the prosthetic will be placed on the 4 dental implants. 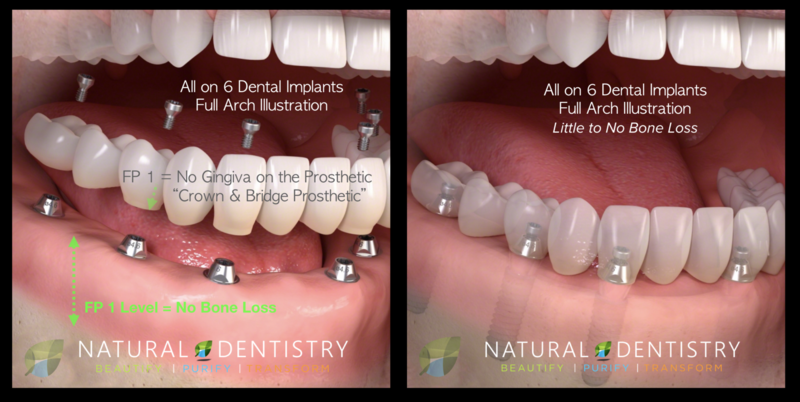 Similarly, All on 6 Full Arch Prosthetic or All on 6 Surgery means the dental implant specialist like Dr. May will place 6 implants into one of the jaws and then attach a full prosthetic with “all” the teeth for the arch to the 6 dental implants. Often, skilled and experienced dental implant surgeons like Dr. Yuriy May perform any All on X dental implant case that is suited for each individual patient and their clinical situation. Dr. May has done All on 4, All on 5, All on 6 and All on 8 cases today, highlighting the importance of finding a surgeon who is fluid, experienced and has the ability to customize the number of dental implants for each patient given their clinical presentation. Ideally, its always better to place more implants than less implants for an All on X case, thus 6 is generally better than 4, but the number of implants placed is typically dictated by the patient’s bone levels and the amount of surgery they want to undergo. Most of the time, patients don’t choose to do All on 4 and only pursue that option when their bone is severely compromised or they want to avoid additional grafting or sinus lift surgeries. In reality, the most common of the “All on X” dental implant cases is the placement of 6 implants, because it is an “even” number therefor symmetrical as in 3 on one side of the midline (middle of the jaw) and 3 on the other side of the midline. In the most ideal situations, that aren’t compromised by bone loss or dropped sinuses, Dr. May places at least 8 implants per jaw due to better prosthetic design and bite force distribution, better bone retention over time, and more long term survivability of the implants and prosthetic. In the most compromised dental patients, Dr. May places a minimum of 4 dental implants utilizing the “All on 4” technique. This is typically done to avoid either performing sinus lifts in the back of the upper jaw or because too much bone is lost in the posterior region. The downside with All on 4 dental implants is in case 1 implant fails, the entire prosthetic is put at risk. In the case of an All on 6 dental implants case when 6 dental implants are placed, if one implant fails immediately or over time, the remaining 5 dental implants can still fully support the prosthetic. In the case of a single implant failure in a 4 dental implant case, surgery has to be done again to place more implants. The All on 6 implant surgery is the most common of all because most individuals who have lost bone or teeth tend to lose teeth in the posterior region (the back teeth) first, and over time also lose bone in those areas. This means that there is typically enough bone to only place 6 or in the worst cases of posterior (back teeth) bone loss, 4 dental implants for the full arch. Which All on X Dental Implant Prosthetic Is Best? Benefits of Ceramic Prosthetic: Highly durable, little chance of fracture or breakage, low plaque adhesion making it the most hygienic prosthesis. Highly esthetic. Requires minimal bone reduction and prosthetic is thinner and more comfortable for the patient. Maintenance: Virtually none. Use hydro-flosser daily to clean under and around prosthetic. See the dental implant specialist, Dr. May 2x a year for cleanings. Disadvantages of Acrylic Prosthetic: More prone to breakage and fracture, less hygienic and easily accumulates plaque, less esthetic compared to zirconia full arch prosthetic. For surgical planning, requires more bone reduction because acrylic full arch prosthetics need more thickness than zirconia prosthetics. The acrylic base and prosthetic teeth that form the body of the hybrid denture are prone to wear, chipping and fracture. Maintenance: More hands one than zirconia due to the material being less hygienic and less durable material. Clean often and well. Use hydro-flosser daily to clean under and around prosthetic. Rinse often. See the dental implant specialist, Dr. May for cleanings 2x a year and removal maybe need to remove plaques. Benefits of Peek: Lightweight, more flexible and can absorb more shock than a zirconia prosthetic, very esthetic due to individual crowns, allows fixing individual crown prosthetics in the future and reduces for pekkton framework cracking/breaking. Highly hygienic like zirconia bridge prosthetic. Patients have a real “life like” experience and can floss between the teeth (crowns.) Highly durable and long lasting, thin and comfortable. Disadvantages of Acrylic Prosthetic: Highest cost option due to need to make individual crowns (10-12 individual crowns is beautiful but requires a larger investment). Maintenance: Virtually none. Use hydro-flosser daily to clean under and around prosthetic. Floss between crowns for “real life teeth experience.” See the dental implant specialist, Dr. May 2x a year for cleanings. In many cases, a high degree of maintenance is required over the life of the restoration to reinforce the body of the prosthesis. This is because fixed full-arch implant restorations are subject to substantial forces associated with masticatory function, parafunctional habits, and bruxism. In the long term, this often causes hybrid dentures to break down, requiring ongoing main- tenance and replacement of the prosthetic teeth or acrylic base. 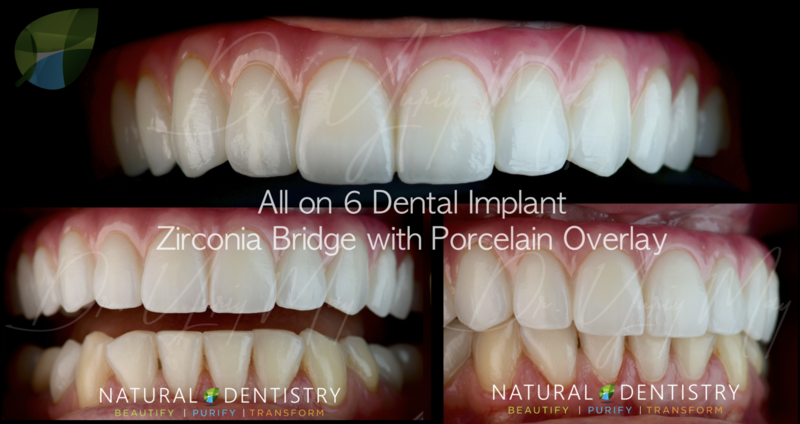 After years of encountering such issues, Dr. May now only works with and recommends rehabilitating his fully edentulous patients with the Zirconia-Based or Pekkton All on X Implant prosthetics and bridges. Long term, we Dr. May believes its really a more financially conservative option in order to avoid patients spending thousands of dollars for a less esthetic, less durable, less hygienic acrylic denture that ultimately ends up broken. Covani U, Cornelini R, Calvo JL, Tonelli P, Barone A. Bone remodeling around implants placed in fresh extraction sockets. Int J Periodontics Re- storative Dent. 2010 Dec;30(6):601–7. Awad M, Locker D, Korner-Bitensky N, Feine J. Measuring the effect of intra-oral implant rehabilitation on health-related quality of life in a ran- domized controlled clinical trial. J Dent Res. 2000 Sep;79(9):1659–63. Limmer B, Sanders AE, Reside G, Cooper LF. Complications and Pa- tient-Centered Outcomes with an Implant-Supported Monolithic Zirconia Fixed Dental Prosthesis: 1 Year Results. J Prosthodont. 2014 Jan 6. How To Select the Best Holistic Dentist for Amalgam Removal? Website & Digital Marketing by Elevate Strategy Consulting, Inc.